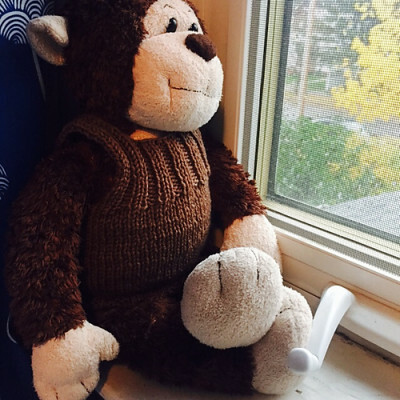 In today’s world, a hipster monkey needs proper attire in which to stare pensively out the window on a rainy day. The organic, free range coffee he loves best is gone. Sad monkey stares into the clouds. Knit in a latte-inspired colour of worsted yarn, this classic baby vest will make any baby or monkey fashionably thoughtful even if they can’t drink coffee on an overcast morning. I’ve been thinking of applying to be a catalogue copy-writer. What do you think? More seriously, I’ve been having a little fun making baby things this fall for a cousin’s soon-to-be second baby. 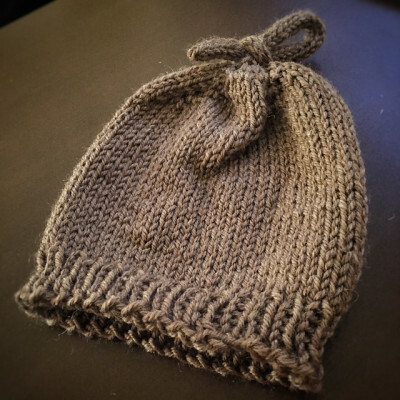 I really enjoy how the tiny things work up, the way you can make something super cute or ridiculously gentleman-in-his-library just by changing the yarns. Felipe is a free vest pattern by Joji Locatelli that cuddles around a newborn baby’s impossibly rounded belly with a jaunty English country house air, if you knit it that way. I didn’t knit the matching hat this time. I knit the It’s My Party Hat because I needed something top-down. I play for Gryffindor in the Harry Potter Knit and Crochet House Cup on Ravelry. Quidditch this term is a pretty fun version of a maze and I needed something that matched a prompt wherein I was flipped upside-down by fog when I took a particular path. It’s a cute, quick pattern and I can see myself knitting it again. It’s got multiple versions – top-down, bottom-up, rolled brim, ribbed… My sister did one with a green icord and orange for the body and it’s an adorable little pumpkin. I decided to go all out for bonus points on the photo staging. 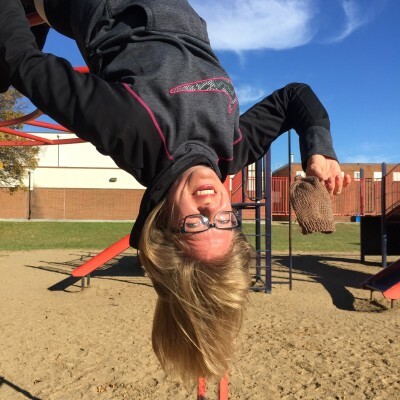 Just before soccer practice one day I had my daughter take this photo of me dangling from the monkey bars. I was wearing my team training pants, a totally synthetic workout fabric, and getting into position was pretty precariously slippery at times. I felt most secure upside-down because my feet were anchored!